Arlie was born in Jack's Branch, Texas and graduated from Nederland High School, where "Pee Wee" Duff (as he was known then) was an All-State basketball player his senior year. Later, he served his country in the US Navy for three years during World War II. After his discharge, He continued his education and earned a Bachelor of Science degree as well as a Master of Arts in Education degree from Stephen F. Austin State College in Nacogdoches , TX. While attending college, he continued his basketball prowess, being named to the All-Conference team while being captain of the varsity team. 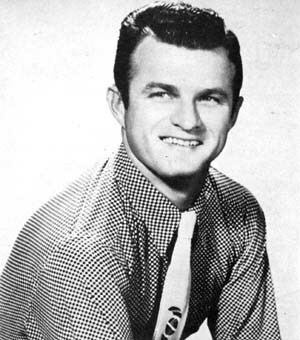 Arlie had written a number of songs - novelties, ballads and religious numbers - but never took any of them seriously until he met Gordon Baxter, a Port Arthur, Texas, disc jockey. Mr. Baxter, who had worked with Arlie on college shows, encouraged Arlie to keep on singing. Arlie took his friend's advice. He did some singing with Blackie Crawford and his "Western Cherokees," and soon became a regular member. 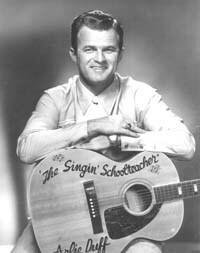 He was teaching school and coaching until he wrote the country classic, "Y'all come" (originally, it was titled "You All Come"). In the mid-1950s, Arlie Duff was making a name for himself in the south, in states like Texas, Louisiana and Mississippi. He was said to have a big smile and a voice to match. They wrote that every time he stepped on stage, audiences would commence to clapping their hands and stomping their feet and start shouting "Y'all Come" at the top of their lungs, singing along to his signature song, "Y'all Come". His daughter Becky related to us a story of one such incident she saw as a youngster at one of Arlie's concert appearances, even nearly a decade after writing and recording the song. It was in 1969 in Austin, Texas where he was well known locally. Arlie was asked to emcee country acts that performed at the Municipal Auditorium from time to time. On this particular show, the stars appearing on stage were George Jones, Tammy Wynnette and Jerry Lee Lewis. They had each performed several songs and the crowd was really energetic. While George was on stage, he yelled out to Arlie to come out and sing "Y'all Come". Becky was backstage and could see the stage and the crowd. She remembers: "When Dad started singing, the crowd was off their chairs and went wild with cheering and clapping. There were several encores with George joining in the second round." She remembers being blown away by the enthusiasm and excitement of the crowd, beginning to realize just how popular that song was. It was the highlight of the evening, which said a lot considering the talent that was performing on stage that night. 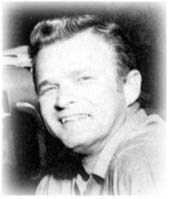 When Arlie was a part of the KNUZ Houston Hometown Jamboree in 1954, they said he was the featured attraction of the show. His Starday recordings and singing was gaining him rave reviews. "Y'all Come" was the theme song of the Houston Hometown Jamboree and the audience always got into it and joining in the singing of the chorus. Arlie began singing with his father Adolphus and sister Lois at a very early age. The "Duff Trio," as the group was called then, were a group that were known for the gospel tunes they performed and were quite popular at singing conventions and school shows such as the Stamps, Hartford and Vaughn Music Company conventions in Texas. Arlie Duff married the former Nancy White after an 18 day courtship on October 10, 1954. The wedding took place during the Louisiana Hayride. Red Foley was best man and sang "I love You Truly" and "Every Step of the Way". It seems that Arlie had just joined the cast of Red Foley's show, "Ozark Jubilee" a few weeks before that. It was there he first met Nancy. The ushers for the bridegroom included other notable members of the Ozark Jubilee radio cast: Hawkshaw Hawkins, Porter Wagoner, Billy Walker and Tommy Sosebee. They were married for 42 years and they had nine children. Arlie also appeared on Herb Henson's TV and Radio Show out of Bakersfield, California as well as on the AV Bamford Tour. Hillbilly and Cowboy Hit Parade No. 5 (Spring 1954) Capitol Stories, Inc.; Charlton Building; Derby, CT.
Country Song Roundup No. 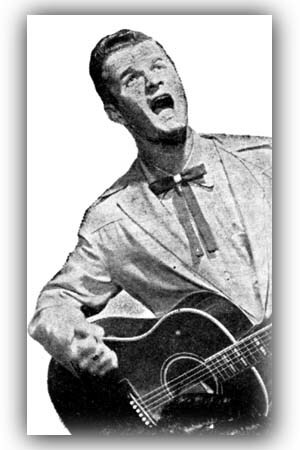 34 (Sep 1954); American Folk Publications, Inc.; Derby, CT.
Country Song Roundup No. 33 (Jul-Aug 1954); American Folk Publications, Inc.; Derby, CT.